Spacecraft controllers have just awoken Rosetta from hibernation to prepare for its encounter with asteroid (2867) Steins on 5 September. ESA's comet chaser will study the relatively rare asteroid as it flies by on its way to comet 67/P Churyumov-Gerasimenko. After its last planetary swing-by on 13 November last year, Rosetta headed towards the asteroid belt located between the orbits of Mars and Jupiter. On 27 March 2008, the spacecraft switched to its near-Sun hibernation mode for a period of three months. During this phase, a few subsystems were put into a dormant state to optimise their lifetime (as this is only the beginning of the mission's science phase). � Rosetta will be closest to (2867) Steins at 20:37 CEST on 5 September, at a distance of 800 km. The spacecraft will zoom past at a relative speed of 8.6 km/s. Asteroids are samples of the Solar System's material at different stages of evolution, and studying them helps scientists understand the origin and evolution of Earth and of our planetary neighbourhood. 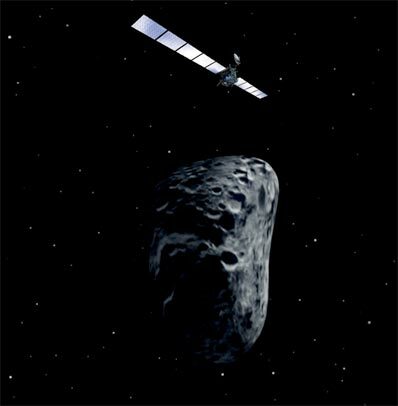 The observations will be used to characterise the asteroid and its environment and to test Rosetta's instruments, most of which will be active during the fly-by. The fly-by will push Rosetta to its design limits, especially owing to the fast rotation of the spacecraft around the time of closest approach. The manoeuvre is necessary to ensure that the asteroid will stay in the field of view of the instruments. In view of this, a full in-flight simulation of the fly-by was performed on 24 March 2008. The tests were successful, confirming the spacecraft's robustness.